I first purchased the original as I was looking for a holster to wear with basketball shorts and sweat pants. I immediately fell in love with it and found myself using it with jeans and a belt frequently. 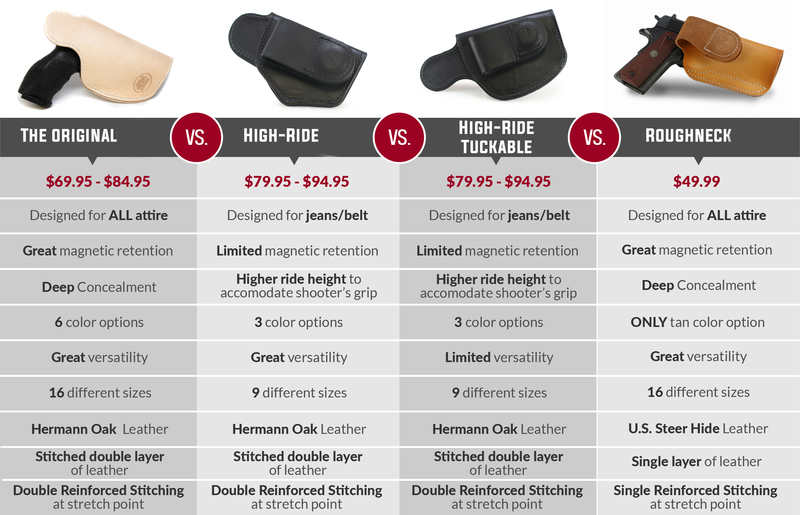 I wanted something that rode a little higher though both for comfort and ease of drawing my gun so I ordered the high-ride. I am so glad I did as this is another fine holster and works perfectly with jeans and a belt. The height is just enough additional that the entire grip is exposed for drawing and comfort, but not one bit of conceal ability is sacrificed. I just used it this weekend carrying at about the 8 o'clock position (I'm a lefty) while I helped move a good friend. Bending, lifting, stretching, etc. with not one issue of my gun shifting or being exposed while in complete comfort. It has become my daily go-to holster along with my Glock 43 as I can't carry while at work, but it makes life easier to carry on the commute and for those after work errands. I highly recommend getting both the original and high-ride to accommodate any wardrobe selection. Just love this holster! First it is really made very well and is worth every penny! It lives up to everything you see in company videos! I probably will buy another for my brothers birthday gift!